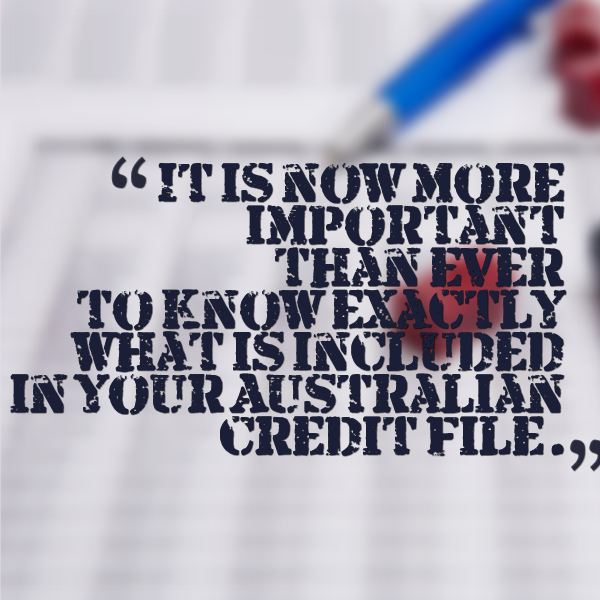 With the new privacy laws that have just come in in March of 2014 it is now more important than ever to know exactly what is included in your Australian credit file. So I am going to cover that in this post so you know exactly what are people looking at when they are accessing your credit file and how you can keep a clean credit file. Ok, so new changes have taken place in March 2014 as to what exactly is on your credit file and what details people in institutions have access to when they are accessing your credit file. It have become a bit more stringent and you actually need to be more careful then you’ve ever used to be about paying your bills on time and so forth. So we’re just going to go through the list of what exactly is included on your credit card. Firstly your personal details are included on your credit card. That is everything from you name, your address, you current employment and so forth. So all your personal details are going to be on there. So the second thing that is going to be on your Australian file is any business ownerships or directorships that you are involved in. That means if you own a business, whether you are a sole trader or a Pty Ltd company or anything in between or if you are a director of a company then that is going show up on your credit file. Lenders or whoever is enquiring about you credit file will be able to see that. Next thing that they will be able to see is credit applications that have been done in the last five years. So, if you’ve applied for credit for anything whether it could be a home loan or a credit card or a store credit card or some other form of credit that is going to stay on your credit card for the next five years. So any credit application you do will show up there. So if you have a credit card where you currently got credit on there, if you have a phone where you get credit applied to you because you pay your bill after the month has already passed or if you’ve got internet or if you’ve some sort of interest free loan or if you’ve got a home loan then all of those credit accounts are going to show up on your credit file. Next it will show when accounts were opened and closed and what the credit limit was. So if you had a credit card and you’ve opened it and then you’ve had it for a while and then you closed it is going to show on your credit file when you opened that account, when you had that credit, when you closed that credit and when you ended that credit card. Maybe you paid it off, maybe canceled it. And it is also going to show them the credit limit as well so whether that will be 5 grand, 1 grand, 10 grand, whatever it may be is going to be on there. Here is the thing that you need to be careful of. It is going to show overdue accounts where the provider couldn’t locate you for the next seven years. 7 years! That is a very long time. So if you don’t pay your phone bill and then you change your address/your phone number and they try to get in contact with you and all they’ve got is your old address and your old phone number. You don’t even know that you owe a bill but they try to get in contact with you an obviously they can’t because you’ve moved on. That is going to be on your credit card for seven years if you are unable to pay for that and they couldn’t locate you. So that’s why you definitely want to be paying your bills on time, you don’t want to be getting into that position where you’ve got seven years, where you’ve got that defect on your credit file. They will also be able to see the number of credit enquiries made on your account. This is important because a lot of people don’t understand when they are going home loan shopping and they are going to a bunch of different banks than each time they ask whether they will be approved for that loan or they want to get preapproval the bank is going to do a check on your credit file and every time you that you are going to get a check against your credit file. Now this isn’t inherently bad, it just means that people are looking in your credit file. But there are a lot of I guess systems and algorithms that had been set up by these lending institutions that if they see a certain amount of attempts to view your credit file that will automatically red flag that and they won’t give you credit. So luckily I could sign up using my wife’s name, she didn’t have all those checks against her name but that is definitely something that you need to consider when looking at home loans. Ask “will I be approved for this” but make sure you say to them “do not check my credit file because you will get mark against that”. Or better yet go to visit a mortgage broker and they can help you see which loan is going to be the best for you without actually putting a check on your credit file. So you can check out mortgage brokers we recommend by going to OnProperty.com.au/brokers. They will also be able to see (now this is with the new changes that came in in March) repayment history for any consumer credit payments that you failed to make on time to a credit provider that holds an Australian credit license. This is going to stay on there for two years. This means if you miss a payment on your home loan or if you do a part payment and don’t pay it in full that is going to come up as a miss payment on your credit file so you really want to be paying your bills on time. This is something that they haven’t necessarily had an access to before all this light payments and stuff like that. So I’m not sure how it works with things like your electricity company and your phone bill provider and stuff like that, whether they actually hold the Australian credit license and whether this shows up when you credit file but truthfully I would not be taking any risk. Basically what this means is you used to let your electricity bill go over and when they hound at you for the second or the third time then you would go and pay it? Well, don’t do that anymore, try and pay your bills on time every time because if you are late at paying your bills that may end up on your credit file and may stop you from getting a home loan or may cause to have high interest rate because you need to go outside of the traditional lenders or the big four banks, whoever. So make sure you pay your bills on time because otherwise it may show up. What else is going to be on there? Bankruptcies obviously are going to be on there. I think bankruptcy is on there for about seven years but you can correct me if I’m wrong because I’m not 100% sure on that. And I’ve been speaking with a few mortgage and they say that once you are bankrupt you are always going to have some sort of trouble because even though it comes off your credit file, somehow banks seem to know who is bankrupt and who isn’t. I don’t know exactly how that works, you can speak to your mortgage broker to find out more about that but bankruptcy is definitely something that I would try to avoid and pay my debt so I don’t end up bankrupt. And then also any court judgments against you are going to show up on your credit file as well. 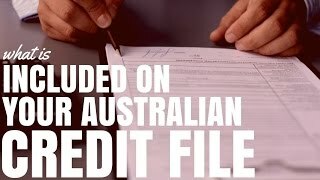 So there you have a short list of some of the thing that are going to be included on your Australian credit file, with the new changes they came in in March 2014. The biggest thing that you need to know is that is now more important than ever to pay your bills on time and to be careful when managing your credit. Don’t get credit cards you can’t afford to pay for and don’t get bills that you can’t afford to pay and just make sure that you pay them on time because if you want to go ahead and buy a house the cleaner your credit file, the better it is going to be for you. Episode sponsored by North Dakota Oil Housing – With investments starting for as little as $33,950 and rental yields of 37%+ p.a. supported by the world’s largest oil companies it is a great way to get your feet wet in the American property market.